Ben and I are approaching the four year mark as Pittsburgh residents. There are still local must-visits we have yet to experience. Some of them would arouse an immediate gasp from those born and raised in Pittsburgh (Kennywood. I can feel your shock). When the Pittsburgh Opera invited Ben and me to attend the The Elixir of Love, a comedy about a vibrant traveling medicine salesman, Dr. Dulcamara, who claims to possess a love potion, we were eager to attend. Attending a live production at the Benedum Center for Performing Arts had been on the list. We just never thought it would an opera. Being 32 and having yet to experience an opera, I was a mixed bag of emotions, like gingerly walking into high school on the first day. Ben and I made it a date night. We dressed up to get down with the opera. As Ben proclaimed prior to the first note played, "Let's Opera!" As soon as we entered the Benedum Center lobby, the energy smacked us like an invisible glass door. It was palpable and contagious. Our first time jitters eased and our excitement grew. To our thirsty delight, Wigle Whiskey was providing free samples of their own love concoction. Inspired by the Dr. Dulcamara's Elixir of Love, Wigle's Rhubarb Liqueur lays the foundation for this light and bold cocktail. Ben and I toasted to our first opera experience. As we made way to our seats, I recounted all the live musicals I had attended. But, I stopped myself as a conversation with Chris Cox, Director of Marketing and Communications for the Pittsburgh Opera, popped into my head about musicals vs. operas. There is distinct difference between the two. One of the most eloquent explanations of the difference, I found, was written by Anthony Tommasini in The New York Times, "But in opera, music is the driving force; in musical theater, words come first." Music is a main character in opera. It is as alive and moving, draping the audience to the point where the stage is the entire theater. The Elixir of Love by Gaetano Donizetti is sung in Italian. Being a first-time opera-goer, this was a point of worrisome for me. Would I connect with the story when I didn't understand the language? Within the first minute of the opera, my worry was put to rest. The different language had no bearing on my ability to understand the story and feel the emotion. Music translates through volume, arrangements and silence. It goes beyond words. And just in case there was any confusion, English translations were projected above the stage. The story follows Nemorino, a gentleman of no stature, and his unfailing admiration for Adina, a woman of status and beauty in a picturesque oasis. It is the she-is-out-of-his-league set-up. Of course, others have their sights set on Adina including Sergeant Belcore, who all the ladies swoon. Just as Nemorino's desperation reaches an all-time high, the eccentric Dr. Dulcamara floats into town and sells Nemorino a questionable love potion. Then, the fun heightens. I was floored by the stamina of the performances. The entire cast was rambunctious and fun. From Adina, played by the elegant Russian soprano Ekaterina Siurina, to Nemorino, played by the expressive and strong Dimitri Pittas to Dr. Dulcamara, brilliantly portrayed by Italian bass Paolo Pecchioli to Sergeant Belcore, embodied by the strong baritone of Zachary Nelson (I am exhausted just typing the talent), it is a burst of energy from start to finish. It was the energy I was searching for in what seems like an endless Pittsburgh winter. I am beyond thankful to the Pittsburgh Opera for this introduction to the powerful genre of opera. 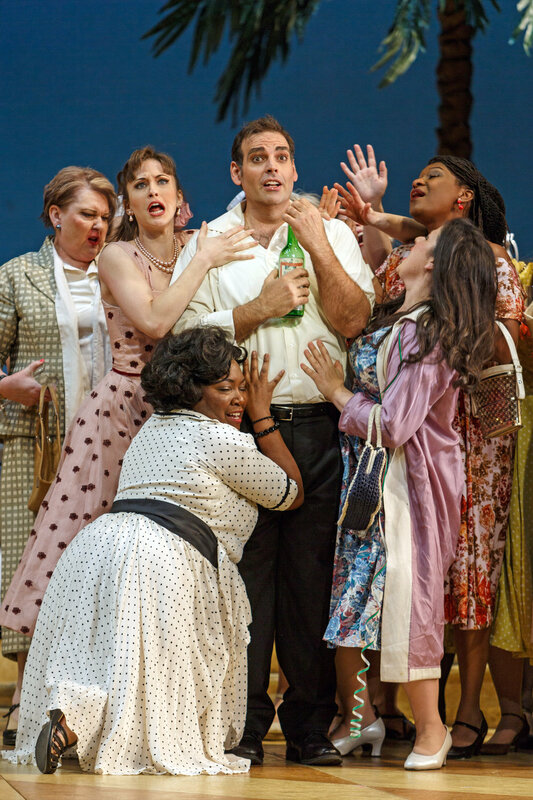 The Elixir of Love is a lovable comedy at its core making it ideal for a first-time opera-goer. Attending this performance was out of my comfort zone. This is what I loved about it. I was open to the thrill of opening night and allowed other audiences members' excitement to feed into mine. The immaculate chandeliers reflected a bit brighter and directed my eyes to the other ornate decorations of the Benedum Center. My attention was focused, as I did not want to miss a moment, a note or a feeling. It was like traveling to the far-off destination for the first time. The good news is this amusing and energetic experience is not a plane trip away; it is simply a visit to downtown Pittsburgh. The Elixir of Love has three more performances (Tues. April 24th, Fri. April 27th and Sun. April 29th) before the conclusion of the 2017-18 season. You can purchase tickets here and prices start as low as $12. The Pittsburgh Opera provides multiple ways for students and education professionals to save on tickets, including Student Rush where students (valid ID required) can arrive two hours prior to any performance and purchase up to two tickets for half price. My first experience with the Pittsburgh Opera was one of admiration. The preparation in The Elixir of Love was apparent as the performance was flawless. It was love at first listen, no potion required. captured by David Bachman Photography. A huge thank you to the Pittsburgh Opera, specifically Chris Cox, Director of Marketing and Communications and Liz Fetchin, renown marketer and founder of Elm Ink. Both were passionate advocates for opera and welcomed me with open arms. This is in partnership with the Pittsburgh Opera, but all words and thoughts are my own.